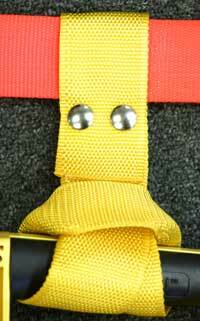 The carry strap for any handled flashlight. 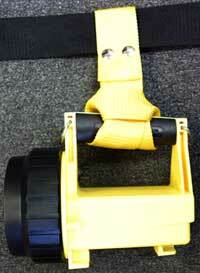 Loops around the handle with heavy duty nylon and attches to any belt. Specifically made for your SCBA since the loop can be attached and removed after your SCBA is buckled using two heavy duty snaps. 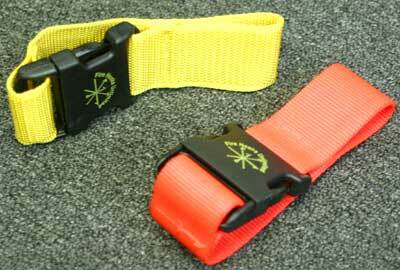 We are using two colors (Yellow and Orange) for lumination in smoke or poor light situations. The Orange matches the New FIRE VULCAN by Streamlight. An emergency release can be made if hung up by pulling a specifically designed tab - Use of this tab can also be used if you wish to use the light in a portable state in your hand. THE LITE DROP IS THE NEWEST AND SAFEST HOLDER FOR YOUR HANDHELD FLASHLIGHT. 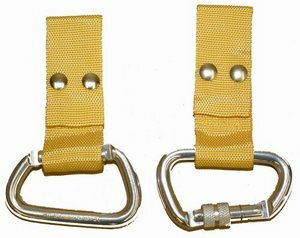 MADE WITH A TWO INCH STRAPING WITH A TWO INCH BELT LOOP, THIS CAN ATTACH TO ANY BELT OR AIR PACK AND WILL STANDUP TO THE RIGORS OF THE JOB. RELEASE - DURING ANY HANGUP. TO BE NOTICED DURING POOR LIGHT SITUATIONS. THE INTERNATIONAL ORANGE MATCHES THE NEWEST FIRE VULCAN FROM STREAMLIGHT INC. 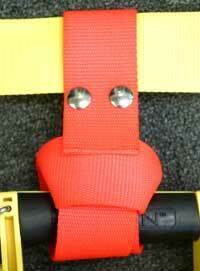 This multi-function strap can be quickly attached to a harness or SCBA waist strap. Can carry an axe, halligan, or a variety of other tools. The carabiner can be removed and used as necessary.